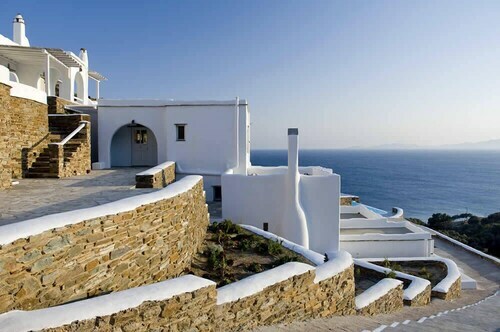 ebookers offers you an easy way to sort through hotel listings once you've decided to visit Tinos Island. Our website rapidly comes up with the best hotels in the area providing you with an assortment of options to pick between. Once you have a curated list, we can help you narrow your search with our site's specific filters. One convenient aspect of our site is our map, which allows you an easy way to pinpoint a specific area for your visit to Tinos Island. You can change the filters to sort by popular location or area to identify accommodation near to the city's local attractions. If you're hunting for hotels in a particular price range, you can filter by price per night to lock down a place to stay that keeps you within budget. 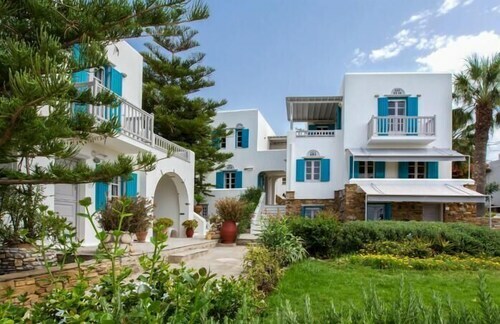 If you'd like certain facilities and services like free wifi or luxury toiletries, you might choose to narrow your search to get all the essentials to make for the perfect visit to Tinos Island. We would like to help you decide how to get to your destination now that you've reserved your Tinos Island hotel. When you want to see all of your transport options in one place, ebookers is your one-stop shop for flights and hired cars. You can search for flights by number of stops, airport location, or departure time to find one that suits you. You may also want to think about ways to get around after you arrive in Tinos Island. You might want to consider having a car for hire handy when you arrive by looking through our car hire deals. You might want to explore all that Tinos Island has to offer by taking in some of the top tourist activities while you're there. Arranging to have a hired car is a way to make getting around the area easy and practical so you can experience all that Tinos Island offers. It's easy to arrange all your travel plans when you book on our site. With your flight and hired car booked, now you can focus on the fun part—planning the activities for your getaway. From food tours to dinner cruises, you can browse our site for Things to Do. You'll be sure to find activities that are perfect for kids and adults alike when browsing our site for tours in Tinos Island. When you've finished scanning through all of your choices, you can see how other travellers have rated activities before making your final selections. You can also earn travel rewards and upgrades in order to make the most of your budget. Now all that's left to do is to relax and enjoy your holiday. Nous avons eu beaucoup de plaisir à séjourner à l'hotel Vega. Les hôtes étaient très accueillants, arrangeants et de bon conseil. Malheureusement il faisait un peu trop froid pour profiter de la piscine en octobre (un peu en plein vent). Neanmoins, nous recommandons chaleureusement ce lieu. Ambiance familiale. Accueil très chaleureux. Sur une longue plage de sable fin. Cuisine grecque authentique très soignée. Vue superbe. Détente. Très beau décor des chambres, typique des îles grecques. J'y retournerai aussi souvent que possible !!!! Schönes Hotel mit neu eingerichteten Zimmer. Sehr guter Service. Vincenzo ist ein sehr netter und aufmerksamer Gastgeber. Zum Abschied gab es ein Gläschen selbst gemachten Wein, welcher wirklich hervorragend ist, und eine Handvoll Aprikosen aus eigenem Anbau.